I’ve slacked a little bit with blogging, so I’ll share some favorite photos from the last few weeks that have been living in my iPhone just dying to get out. They are either part of a bigger, more detailed post that is TBW (To Be Written) or they’re randoms that don’t really have a home, but are too cute to dump. So, this little nook of the Internet is where they shall live. If there’s one thing I don’t understand, it’s how Madelyn can eat slimy, drippy foods and not have the instinct to want to wipe it away. It kills me! 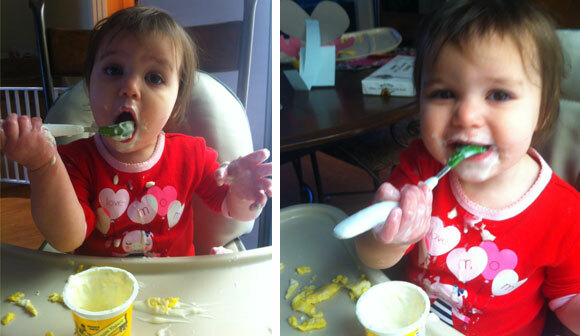 As she eats her yogurt, I want to take a napkin and go to town on her face. Doesn’t she feel that? Doesn’t it bug her? Kids are so weird. Just kidding. I had to put her down real quick while I moved some things in my car, so I stuck her in the driver’s seat. She really liked that. 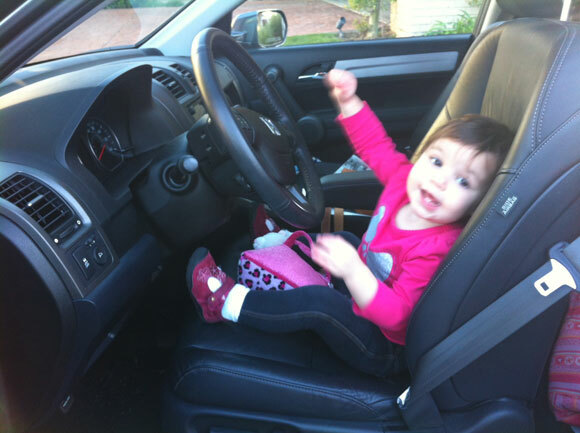 I did not have her chauffer me anywhere, but she did enjoy playing with the steering wheel. We went to Denver (more on that later) and spent a day at a ski resort. It was Madelyn’s first time in the snow and was very confused by the whole thing. 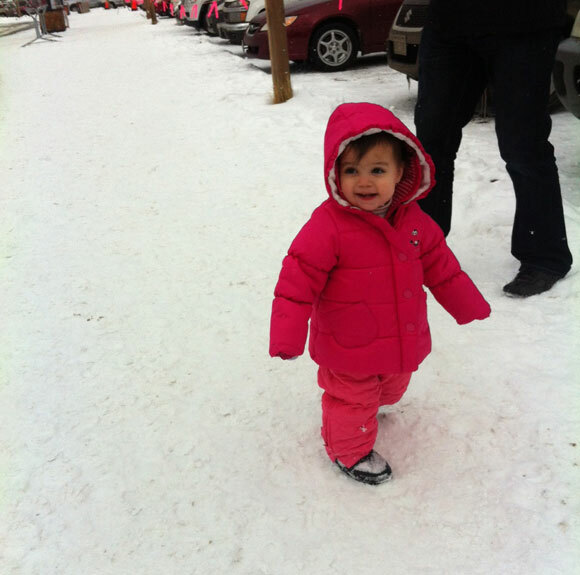 She was so good at walking through the snow in her new boots even though she was packed tight in her winter clothes. Since she didn’t totally hate it, I’m thinking ski lessons are a few years away. 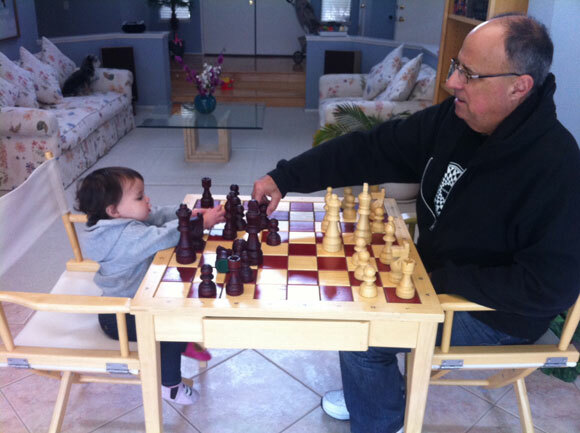 I love this picture of Madelyn and her Grandpa “playing” chess. She likes to go to the chess table in Grandma and Grandpa’s house and rearrange all the pieces. I am never able to clean up after her because I don’t understand chess. I am really good, however, at checkers! Not the same thing?? Anyway, I love how they are both wearing their hoodies and jeans and playing so seriously. That’s what grandpas are for! 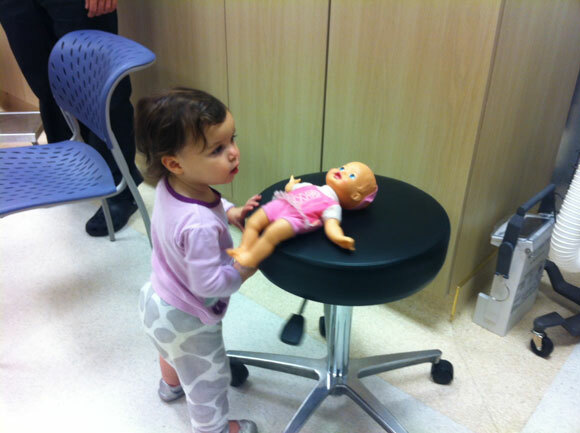 Madelyn spent a couple hours in the ER last month when she woke up at 4 a.m. with a 105 fever! Turns out she was suffering from a pretty bad double ear infection. She may have been running a super high fever, but she still took care of her baby at 4 a.m. just like I was taking care of mine. No sickness gets between a baby and her baby! Madelyn was a flower girl again! 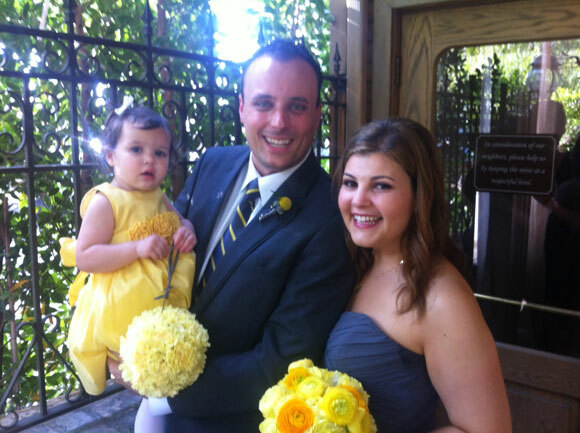 Kevin and Lisa just got married on a beautiful, sunny day in April and Madelyn, decked out in a yellow dress, did such a good job walking down the aisle! I was so nervous that she wouldn’t cooperate, but she swung her yellow pomander aka “purse” over her arm and sauntered down the aisle and when she saw us at the end with the rest of the bridal party, she squealed with delight and ran toward us! The crowd loved it and it was a sweet way to start Kevin and Lisa’s lovely ceremony! Anyone need a flower girl? We can rent her out. She’s quiet a pro now.